Ballpark Basics: Reminiscent of the good ole Midwest, with an emphasis on food and family. 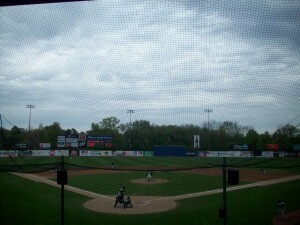 We were there for an April game and the upper Midwest weather had not changed. However, this did not deter the Snappers fans as we witnessed people dressed in everything from winter jackets down to short sleeved shirts (Gotta love the Midwest!). While the crowd was small, the fans were definitely into the game. There was even a small group along the first base bleachers with musical instruments that were reminiscent of the die-hard fans from the Major League film. 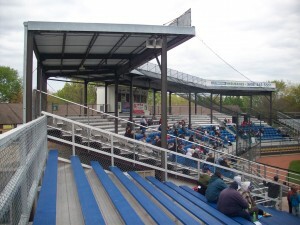 The ballpark is fairly basic with a small covered grandstand and mostly metal bleacher seating aside from six rows of plastic seats in the grandstand. Oddly, these blue seats are placed on top of the actual bleachers so they are not the most comfortable of seats. They have added some additional bleachers down each baseline for general admission seating. The most interesting seats are the Field Boxes which consist of yellow seats placed in front of the grandstand. Lined up in front of the grandstand they give you the best view of the field but they also look a little awkward since it looks as if they just lined up a set of chairs behind the netting. Another aspect of this small ballpark is something that many fans might not notice but we are sure that the players do. The clubhouse is situated behind the concourse so each team actually needs to walk across the concourse to get to the field. Once in the dugout, there is no restroom for the players so you will notice players alongside fans during some of the in-between innings in the restrooms. Definitely an experience you will not find in many ballparks. While the ballpark itself is rather pedestrian, the food options are not. In the right field corner you will find the Hog Cabin. 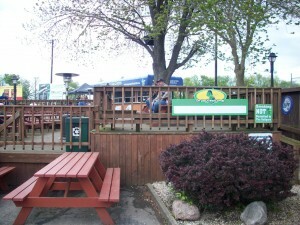 Offering many of your Midwest meat staples you will find multiple options for your sausage fix. In the left field corner you will find the Miller High Life Bullpen Deck with picnic tables and and a large deck overlooking the field. Another area where this ballpark shines is in its options for craft beer. Not only do you have multiple choices for local options including Gray’s, Capital Brewery, Sam Adams and Horny Goat Brewing but they also offer specials on these brews during certain nights of the week. 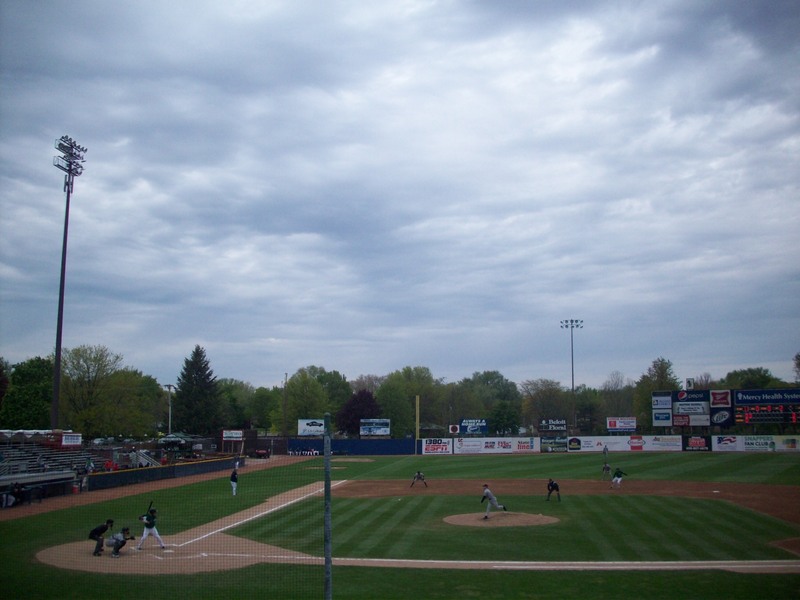 We had just visited the Quad Cities River Bandits park a few nights before and just the disparity between the two complexes made it difficult to believe that these two teams are in the same league. But, while Pohlman Field may be lacking in all the bells and whistles of many of the new ballparks it really was an enjoyable place to watch a game. When the weather is still more suited for sweatshirts and football, and you still have a few hundred people come out to root for their local team, you get an appreciation for those Midwesterners – and perhaps a glimpse at just how ready for spring they are. Brew Basics: Easy to drink, not easy to visit. This brewery presented a bit of a challenge for us. Being ever intrepid reporters, we weighed our options and got the job done. First challenge: The brewery isn’t open on Sunday, the only day we were in the area. Solution: go there anyway, and knock on doors. This has worked for us on other occasions, but not this time. We had to be content to grab a few pictures of the outside. 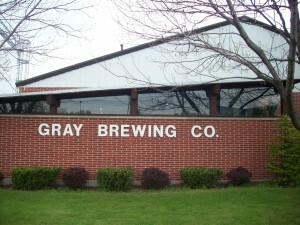 Problem: Gray’s also doesn’t offer brewery tours in person even if we could have gotten in. Problem: If we can’t taste the beer, we can’t write the review. Solution(s! 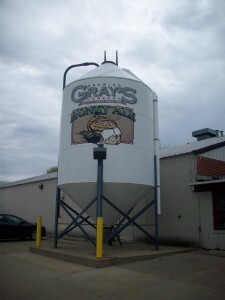 ): Plan A: Go to Gray’s Tied House – their brew pub and restaurant. Located in Verona, Wisconsin, Gray’s Tied House is an “American Bonfire Grill and Brewery” that offers food to go with the gray’s beers, daily specials and even a downtown shuttle bus to the Badgers game if you happen to be there on a football Saturday. While this is obviously not the traditional/ideal/insert descriptor here way to review a spot, it still got the job done. 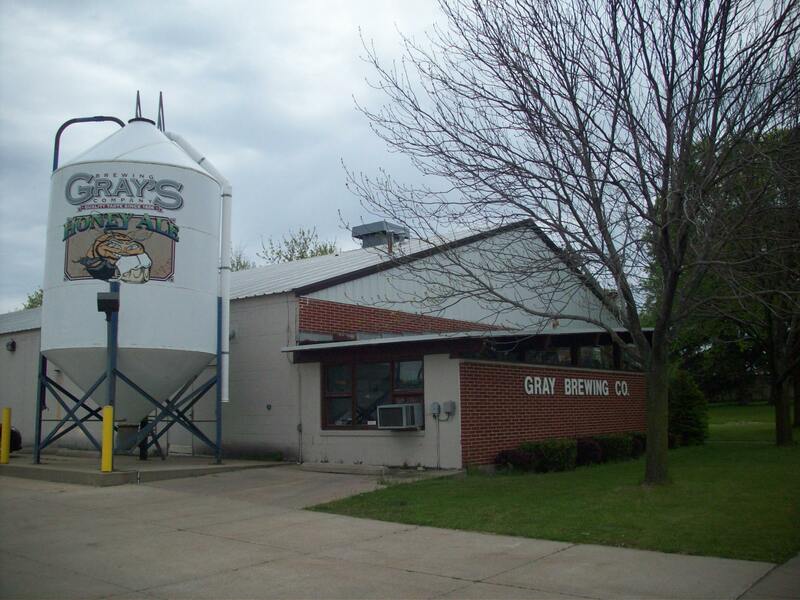 From our trip to get pictures, we know that Grays is located in the small town of Janesville, Wisconsin in a semi-residential/semi-industrial area. 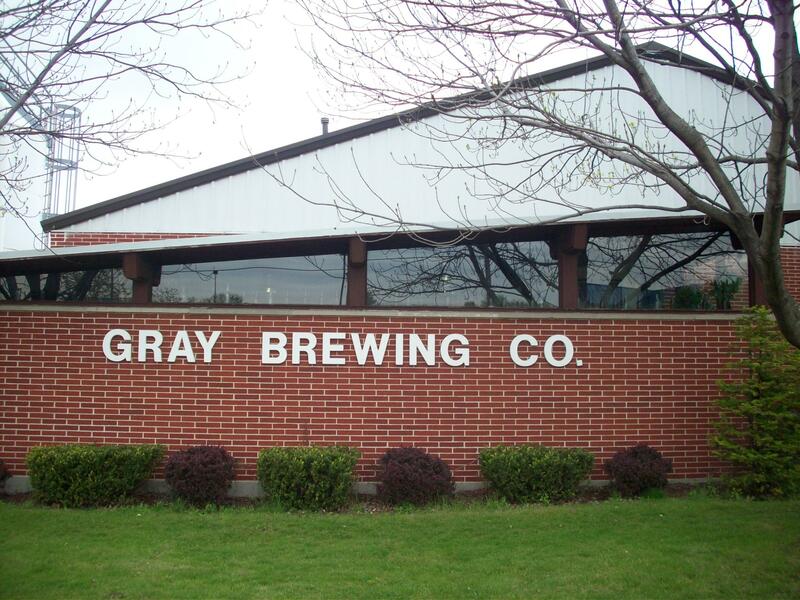 From the website we know that Gray’s Brewing was founded in 1856 by Joshua Gray, and the still-family-owned company brews full lines of both beer and soda. Busted Knuckle Amber (5.2 ABV): An amber ale with slightly cloudy, orange tone and white lacing. The aroma is heavy with caramel notes, that are also quite pronounced in the taste. Although the Busted Knuckle has only moderately high carbonation, it is quite effervescent at first, and it almost gets in the way of the taste. Throughout the sip, the tingle doesn’t subside, but the flavor persists, so the palate is sweet upfront and the grains then become more pronounced at the end of the sip. A good, fairly traditional amber that is not terribly unique, but just what you expect out of a decent beer of this style. Gray’s Honey Ale (4.78 ABV): Pours very clear so that it looks like a lager but in taste and feel is much more a golden ale. Gray’s Honey has a light, light hue that is (aptly) the color of honey and comes with very visible lines of very active bubbles. Gray’s promotes this one as having been brewed with 100% pure honey, and while there is that hint of sweet in the aroma, the bouquet is actually more floral than anything else (this may depend on the specific kind of honey they are using). A floral palate follows the floral aroma, and you may find the honey to be most pronounced in the one or two seconds after the swallow. Wisco Wheat (4.41 ABV) – An unfiltered weizen style beer that is not as carbonated as the others, and easy to drink. From the name we were expecting a dry, earthy drink but there is actually sweet fruit in the bouquet and the banana notes on the tongue in the traditional hefeweizen style. Other than that, the Wisco is light but solidly flavored. The fruity aroma aside, wheat comes through in the initial sip and then gives way to a well-blended palate, which is a good thing, because if it was as sweet as it smelled, it probably wouldn’t be as good. Bully Porter (4.95 ABV)– At first this one looks similar to root beer in color, but hold it up to the sunlight to see its true ruby red tones. The Bully has a rich, roasted aroma with just a hint of coffee malts and more carbonation that common in a porter but not as much as either the Honey Ale or Busted Knuckle. The palate itself was not as robust as expected, and actually had a bit of a sour taste. And though it is not really a front-loaded beer, it does pick up decent nuttiness and even a hint of coffee by the back end. Not bad, but also not our favorite Gray.